A request for a France 1940 game (Dunkirk Movie just came out) and a desire to get some French tanks out on the table made me look for a quick and easy scenario. So I stole the Jandrain game from Rob Avery's Vis Lardica site. 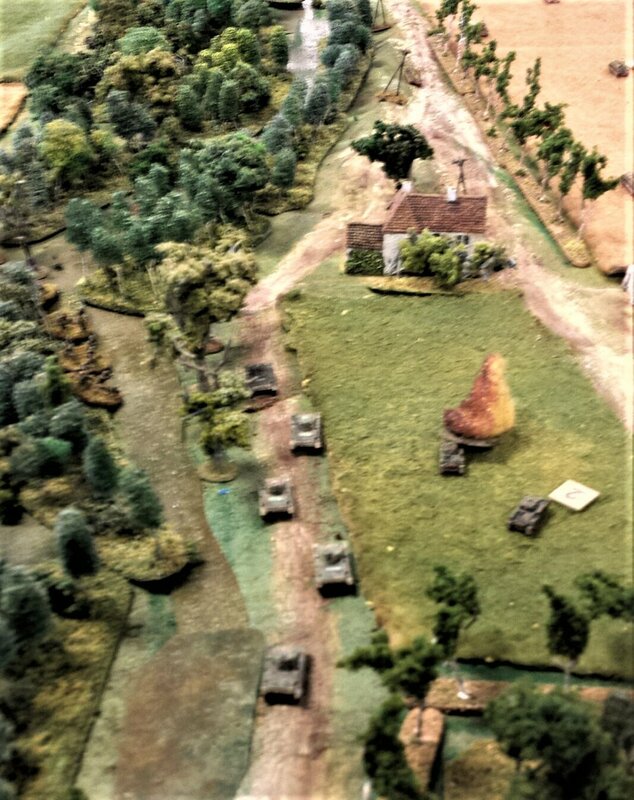 The game focuses on the French counterattack by SOMUA S-35s of the 3rd Light Mechanized Division against the panzers of the 3rd Panzer Division on the morning of May 13, 1940. The Panzers had pushed the French Dragoons out of Orp in the morning and were reported to be moving to Jandrain when the French launched the attack by the 1st Cuirassiers. 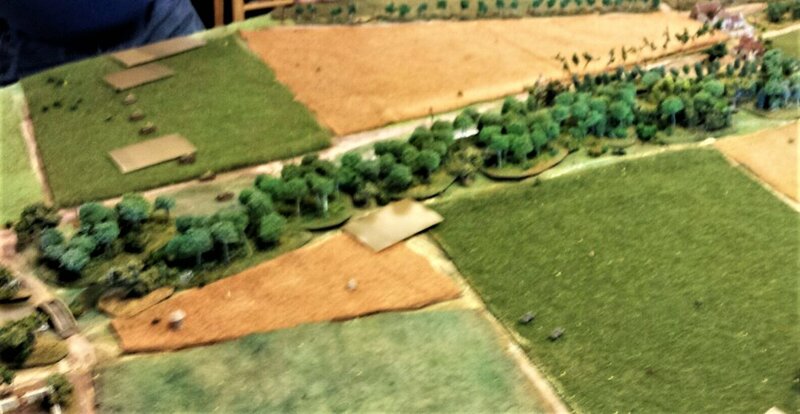 The French come in from the left and the Germans can set up on the right side with their reinforcements coming in from that edge. They start with ten Somuas and a platoon of motorcycle troops and a pair of Panhard armoured cars. The main decision was on what side of the stream to move along. They took the left side and sent the Panhards out on the right. Trace (commanding the light panzers) and Logan (the German armoured cars) in their first game getting a briefing from Matt (the heavier panzers). The Germans started the game with two platoons of panzers on table (one with two Panzer I and three Panzer II, and the other with four Panzer II), four PaK 35 ATGs, and an FO for a 105mm battery. There were also two pairs of Sdkfz 221 and 222. Most everything was deployed on their right. Only two of the PaKs were on the left side of the stream. With a couple of crazy men driving the wrong way! They were on the left flank making good time through the fields This unit had three sections on bikes and two in trucks, which went down the other flank with the Panhards. Another fussy pic: curse you Samsung phone! 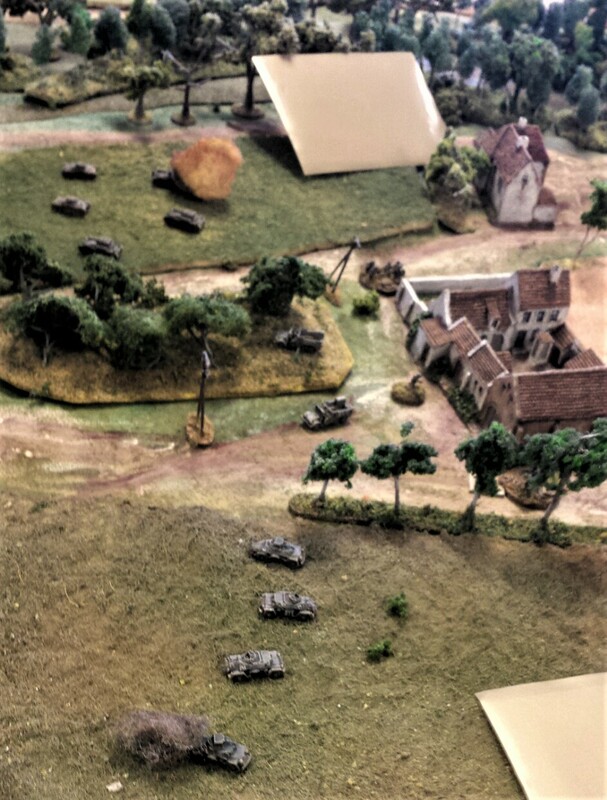 Armoured cars in the foreground (rookie player deployment). Two of the PaKs around the walled farm. The mixed light platoon moving up and getting picked off. The Blind to the lower right is the other Panzer II platoon. They just got too far ahead and ran into too many automatic weapons. 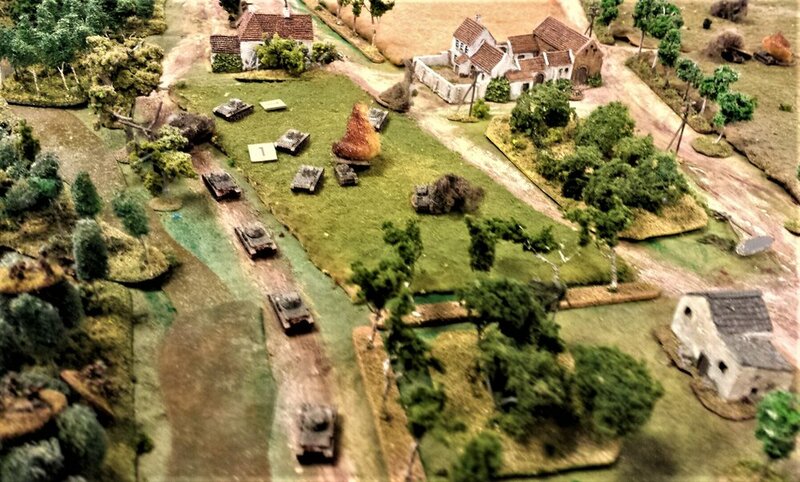 Chris moved up the small group of two sections of truck-borne motorcycle troops and the two French armoured cars. The two PaKs lost the fight against them, so the survivors of the mixed platoons swung over to hold them off. Five Panzer III move up. By this time the S35s had taken out both PaKs and the armoured cars, so they got there just in time. One had become immobilized, one bailed out, another had a damaged turret. Trace and Logan had to leave, but they were just about out of units. The lead Panzer IV is knocked out. The French motorcycle men were also wiped out. The other bikers were in the woods along the creek. Six S-35s were still runners.